Houston? No. Kennedy Space Center? No. Mississippi? You Better Believe It! - Mississippi Believe It! Home » Resources » Campaign » Houston? No. Kennedy Space Center? No. Mississippi? You Better Believe It! NASA’s Center of Excellence for rocket propulsion testing isn’t in Houston, or even Florida. It’s Stennis Space Center in South Mississippi. As NASA’s primary rocket propulsion testing ground, Stennis is currently preparing to test RS-25, the engine that will drive NASA’s new Space Launch System into deep space. NASA is also partnering with commercial interests to provide space travel and transportation, and is working with other companies to supply rocket propulsion testing. Stennis employs 5,000 people – 1,500 of which work in the fields of science and engineering. 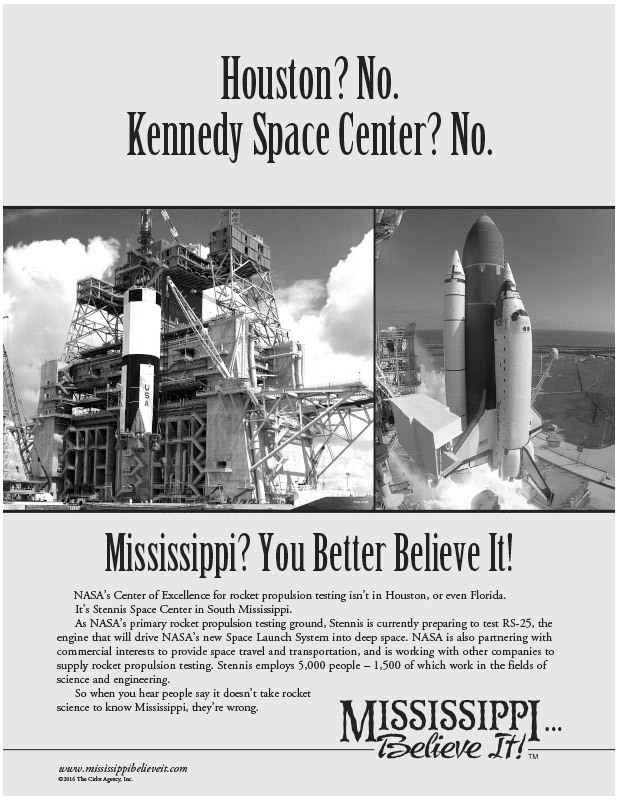 So when you hear people say it doesn’t take rocket science to know Mississippi, they’re wrong.